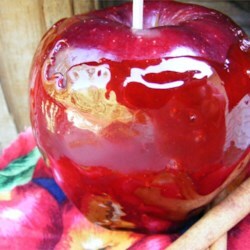 Just for fun I made candied apples one year at Christmas with a candy cane instead of a stick. Start a punch hole with a small paring knife then put the non-hook end into the apple so the crook of the cane sticks out. I also crushed starlight mints candies and rolled the apples in the crushed candies, mostly just for decoration (not so much for flavor). They were really pretty!